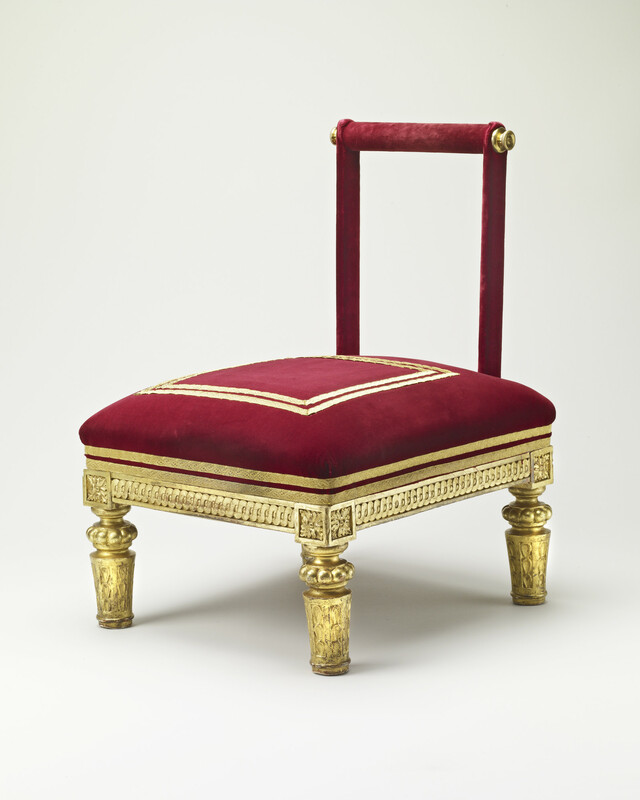 This stool is used during ceremonies of Investiture for the appointment of Knights. The recipient of the honour advances toward the stool, rests one knee on the stool and bows the head. The Queen touches the recipient briefly on each shoulder with the Knighting sword, the sword used by George VI as Colonel of the Scots Guards (RCIN 250092). A knighthood (or a damehood, its female equivalent) is one of the highest honours an individual in the United Kingdom can achieve. While in past centuries knighthood used to be awarded solely for military merit, today it recognises significant contributions to national life. Recipients today range from actors to scientists, and from school head teachers to industrialists. A knighthood cannot be bought and it carries no military obligations to the Sovereign. The Queen (or a member of the Royal Family acting on her behalf) confers knighthood in Britain, either at a public Investiture or privately. The ceremony involves the ceremonial dubbing of the knight by The Queen, and the presentation of insignia. By tradition, clergy receiving a knighthood are not dubbed, as the use of a sword is thought inappropriate for their calling. They are not able to use the title 'Sir'. Foreign citizens occasionally receive honorary knighthoods; they are not dubbed, and they do not use the style 'Sir'. Such knighthoods are conferred by The Queen, on the advice of the Foreign and Commonwealth Office, on those who have made an important contribution to relations between their country and Britain. Foreign citizens given knighthoods over the years include Chancellor Kohl, President Mitterrand and Mayor Giuliani of New York. The origins of knighthood are obscure, but they are said to date back to ancient Rome, where there was a knightly class Ordo Equestris (an order of mounted nobles). Knighthood became an established military guild in many European countries, and it had certain characteristics: a would-be knight would undertake strict military training from boyhood, including some time as an assistant (an esquire) to a knight with whom he rode to war. He would also have to prove himself worthy according to rules of chivalrous behaviour, such as 'faithfulness to his Saviour and his Sovereign', generosity, self-denial, bravery and skill at arms. In addition, he would be expected to have the financial ability to support the honour of knighthood, so that he could provide himself with arms, armour, horses and the required number of armed followers to render military service to his Sovereign for a minimum period each year. In former times, no person could be born a knight: even monarchs and their heirs had to be made knights. Alfred knighted his grandson Athelstan; William I was knighted when he became king (although he had previously been knighted in Normandy); Edward III, Henry VII and Edward VI were all knighted, after coming to the throne, by one of their subjects.The conferment of knighthood involved strict religious rites (encouraged by bishops who saw the necessity of protecting the Church, and of emphasising Christian ideals in order to temper the knights' ferocity), which included fasting, a vigil, bathing, confession and absolution before the ceremony took place. The first and simplest method of knighting was that used on battlefields, when the candidate knelt before the Royal commander of the army and was 'stricken with the sword upon his back and shoulder' with some words such as 'Advances Chevalier au nom de Dieu'. (The action of touching the sword on the recipient's shoulder is known as dubbing.) The second method involved greater ceremony, which could include the offering by the knight of his sword on the altar.Although the monarch's 'lieutenants in the wars' and a few others of high birth could knight others, over the years successive Sovereigns began drastically to limit the power to confer knighthood - particularly Henry VIII. Eventually, it became the custom for monarchs to confer all knighthoods personally, unless this was quite impracticable. In ceremony of knighting, the knight-elect kneels on a knighting-stool in front of The Queen, who then lays the sword blade on the knight's right and then left shoulder. After he has been dubbed, the new knight stands up, and The Queen invests the knight with the insignia of the Order to which he has been appointed, or the Badge of a Knight Bachelor. Contrary to popular belief, the words 'Arise, Sir ...' are not used. Find out what goes on behind the scenes to create the magic and magnificence of an official visit to the Palace.